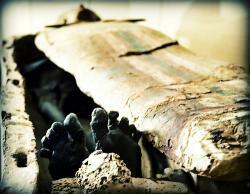 Not every mummy gets wooden toes: But, then again, not every mummy needs wooden toes. (image by Stuck_in_Customs on flickr.com)Another exciting news item has emerged from the fast-paced field of human prosthetics, although on the other end of the chronological spectrum from my post last week. Archaeologists believe they may have found the world’s earliest functioning prosthetic limb (so far). Found on the right foot of an Egyptian mummy, dating from somewhere between 1000 and 600 BC, the prosthesis is a wood and leather big toe. It is not, however, the first ancient Egyptian false toe – another was found near the end of the 19th century, and is probably nearly the same age. The “new” artifact, however, is “articulated and shows signs of wear,” and was found attached to the mummy of a 50-60 year old woman, whose amputation site appears to have healed. The other toe was made of something like papier-mâché, and may have been simply ornamental and not actually supposed to help with walking (something the Egyptians are famous for). A researcher at the University of Manchester has created an exact replica of the ancient toe, and is recruiting volunteers who have lost their right big toes to test the prosthesis’ functionality. The previous record holder for “most ancient prosthesis” was a Roman bronze leg, dating to about 300 BC. It was, however, destroyed during the bombing of London in WWII. Scientists believe that before the invention of objects like these functioning prosthetics, humans who had lost limbs must have resorted to tying everyday items like rocks, flowers, or small animals to amputation sites. Finds like the Egyptian toe force archaeologists to reevaluate the ingenuity of our ancestors, and push those dark days further and further into the depths of the past.